By W. H. Luyties, editor OWOE. Recently, OWOE initiated a series of blogs to take a closer look into the key US government actions to promote fossil fuels. Since the 2016 election, one lightening rod topic has been the push to increase coal and oil production in the US. This has energized both proponents of fossil fuels, who see an opportunity to possibly save their industries (coal) or increase production (petroleum), and opponents, who fear the environmental consequences of such a change. But is this a real threat to the global move away from fossil fuels, or is it simply rhetoric to energize a political base? Our first blog on the subject in March addressed coal. Our conclusion was that coal power is in a downward spiral, and saving the coal industry is rhetoric. As further proof, there have been several notable news announcements since our blog. For instance, energy consultant Navigant issued their updated projection of coal plant retirements at 73 GW in the next decade, which is more than twice what was expected last year. They stated that ““the fundamentals of the economics of coal have gotten worse…””As an example of this, in August the Colorado Public Utilities Commission approved Xcel Energy’s plan to replace coal-fired units at its Comanche Station with a $2.5 billion investment in renewable energy. These plants are being retired at least 10 years earlier than originally planned, even though supporters claim the plants are still efficient and cheap sources of power for ratepayers. After a brief drop following the oil price collapse in 2014, when the price of oil fell from $115 per barrel to a low of $35, US production surged again as the industry found ways to drill and produce more cheaply. 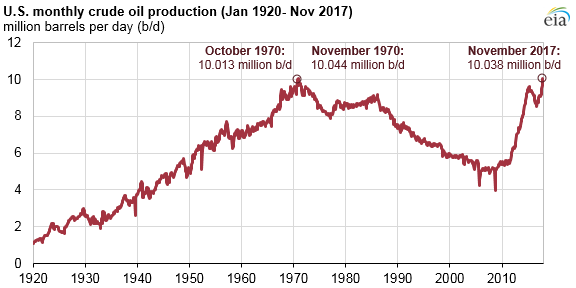 In January 2018 the US produced an average of 10.2 million b/d, the highest in history, and is now close to overtaking Saudi Arabia as the world’s second top oil producer, with top producer Russia in its sights. opening up all offshore federal waters to drilling. In December 2017 the Interior Department announced its proposal to open nearly all U.S. offshore waters to oil and gas drilling. This immediately generated protests from virtually every coastal state, environmentalists and the tourism industry. Subsequently, Interior Secretary Zinke said he would exempt Florida to protect its tourism industry. He has promised to hold discussions with other states that have expressed concerns, but so far nothing has come of that. As a preemptive move, California lawmakers, in a rare bipartisan effort, passed a bill that prohibits the State Lands Commission from approving any new leases for oil facilities, such as pipelines, piers and platforms, in the 3-mile area off the coast controlled by the state. Although this doesn’t prevent drilling and production in federal waters, it would drastically restrict the options oil companies have for development. on the same theme, opening up the Arctic National Wildlife Reserve (ANWR) in Alaska to drilling. In April, Department of Interior officials released a notice that mapped out their first steps toward allowing drilling in ANWR. Environmental groups have promised legal action to block any such drilling. suspend required increases in vehicle fuel economy after 2020 and unwind California’s authority to limit tailpipe greenhouse gas emissions in the state. In August, the Environmental Protection Agency and National Highway Traffic Safety Administration jointly proposed to cap fuel economy requirements in 2020 at a fleet average 37 miles per gallon. Under the earlier plan implemented by the Obama Administration, the requirement would have risen gradually to 47 mpg by 2025. California lawmakers and environmental groups have promised to fight the changes, and even automobile makers are concerned that the pending legal battles will cause chaos in the marketplace. While the intent here might seem to be to help the auto industry by reducing the price of cars, one can also see it as a thinly guised attempt to boost demand for gasoline and therefore crude oil. All of these and others would seem to be pushing the US oil industry ahead aggressively. However, they are running into two economic headwinds – cost and technology. On the cost front, developing oil reserves in frontier regions is very expensive, in particular for the first developments when there is no infrastructure in place. Oil companies are very unlikely to invest billions of dollars trying to find oil in risky frontier regions, and wait up to 10 years to get returns, when they can quickly and easily ramp up shale oil production onshore or extend production in existing offshore fields. Factor in the legal battles that any company would face, and OWOE doesn’t believe such frontier developments will ever materialize. So, is the push for US oil production reality or rhetoric? Probably a little of both. The writing is on the wall that the time of ‘peak oil’ driven by a reduction in demand for petroleum is coming. 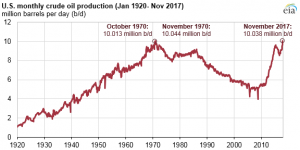 However, it is still a ways in the future and both the US and world will need plenty of oil for several decades, at least. And the US has the ability to use its growing oil production capability to influence world geopolitics. But should residents of California or North Carolina or environmentalist worry about offshore drilling? No. Economics dictates that it won’t happen. Should environmentalists worry about the US turning back to a country driving gas-guzzling vehicles? No. EVs and other advanced transportation technologies are starting to displace the internal combustion engine in significant numbers, just as those engines replaced horses a century ago.